It may only be 3km, but it does link Lewisham to a fairly direct route to Waterloo Bridge. 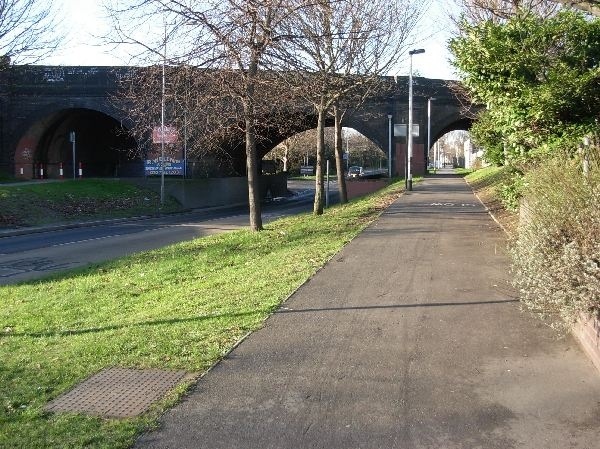 A route which will be, once the Quietways improvements are completed, a much safer, quieter and more pleasant ride than the main road alternatives in the area. We’re pleased. But not totally over the moon. We would have liked to see a toucan crossing at the very dangerous junction cyclists face entering and exiting Folkestone Gardens, but apparently, TfL’s traffic modelling software indicates this is just not possible as it shows unacceptable traffic tailbacks will be created. So we will get a large pedestrian and cycling refuge in the middle of the junction to make a two step crossing of the junction possible, with approaching traffic speeds calmed by speed tables. Which is, admittedly, much safer than the existing situation. Priorities along the Surrey Canal Path should be changed to give cycle traffic priority over motor traffic. And Childers Rd will be made quieter, removing fast rat running by strategic road closures to motor traffic. We know some people think there are still problems with the route. One of these is the safety of the route at night. I can understand this. I don’t think I shall be using the Folkestone Garden section on a winter evening’ commute unless I’m riding with a friend, however well lit it is. However, I modify many of my routes through London for the same reason and I don’t think this is a reason for not supporting the Quietway. It is a reason for campaigning on other issues, though, including segregated routes on the main road routes into Central London alongside Quietway development, and the improvement of our big junctions so they are safe for all road users, for cycling and for walking as well as driving. And we will continue to campaign on these issues. Another reason some Lewisham residents feel disappointed is that,unless you live in the northernmost part of the borough, the Lewisham stretch of this Quietway is not that much use. For those who live in Deptford and New Cross, it will provide a decent and pretty direct link to Central London that won’t take much longer to ride, if at all longer once the route becomes familiar, than the alternatives on the main road. But for the great majority of Lewisham residents, you’d need to make hefty detour to make it a realistic alternative to the A21, Loampit Vale, Lewisham Way and the Old Kent Rd if you are aiming to get to work on time. Again, we acknowledge this, but it is not a reason for withdrawing support from this route, merely one more reminder that there is still a lot a work to do. This short stretch of route is only a beginning and we must make sure it kickstarts more. So, our campaigning on all the other issues, safer junctions, segregated routes on our big main roads, our Space4Cycling ward asks, cycle parking and storage, 20 mph implementation and enforcement, all this will still continue. We hoped for more for Lewisham from Boris’ Cycling Vision two years ago. So, while we hope to see this route up and riding, we will carry on campaigning for wider improvements. Quietway 2 is a start, a small start maybe, but it is a start. You need to look at the plans to see the full picture. If you are unsure of anything (I for one, often need help to make sense of these drawings) drop us a line, or contact the council on the email given directly. Make sure you do it before the closing date on 7th November. Where the proposed quietway leaves Lewisham for Greenwich, it uses the Ha’penny Hatch (Creekside to Norman Road). Walking over there last night, I noticed that there still is no lighting on the Lewisham side of the hatch, nor have they been since last October. As there have been muggings on that path, to which the police won’t attend because they need the postcode, this represents a real danger to walkers and cyclists with poor sight lines. I believe that there’s a question as to who is responsible for the lighting. Lewisham Council certainly haven’t taken responsibility and have passed the buck to the rail company/authority who own the arches. This is an unresolved problem that TfL will need to resolve before any real progress can be made to the Greenwich end of the quietway.